Growing your own herbs can be as simple as sowing a few favorites in pots, or as ambitious as a dedicated herb garden on your property. Not only do they enhance your culinary repertoire, but herbs combine beautifully with other flowers and will attract pollinating insects, too. The added bonus—voles, deer, and other critters tend to leave them alone. Try growing herbs in a planter on a sunny deck. Smaller pots will dry out quickly, so choose one big pot that fits a few different varieties. I love combining herbs and flowers together in one container. The contrast is striking, and it allows me to harvest a few leaves occasionally without altering the overall appearance. But you can grow herbs anywhere there’s available space. A dedicated herb garden, conveniently located near your kitchen, is the perfect way to go. Personally, I tuck my herbs in among my flowers and veggies. It’s usually easy to find open patches for herb plants and I don’t mind traveling around my garden to harvest what I need. 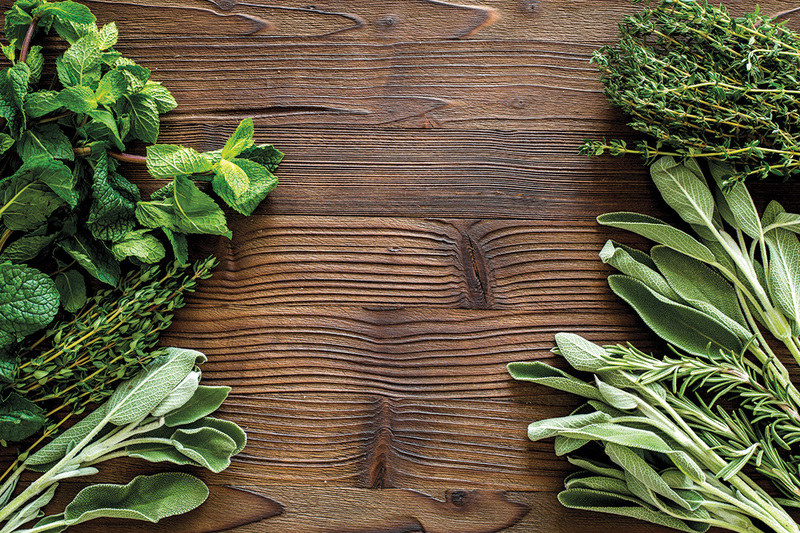 For productive growth and superior flavor, herbs should be grown outside. Growing herbs indoors is possible, but they tend to get spindly, stressed, and weak because interior light doesn’t allow for sufficient photosynthesis. If you’re determined to grow herbs inside, keep them in the sunniest spot possible and supplement with grow lights, as most herbs will need at least six hours of full sun daily. Healthy soil grows healthy plants. If you’re growing in the ground, amend the soil with compost first. If you’re growing herbs in containers, choose a quality potting mix, then stir in some granular, organic fertilizer. What hardy, fuss-free, and yummy culinary herbs can actually handle our high-altitude climate? Perennials are long-lived plants that die back each season and return from their roots the following year. Because they grow slowly from seed, buying herb starts is your best bet. You can’t really kill OREGANO. It grows into a big, bushy plant year after year. Delicate clusters of light pink flowers bloom mid-summer and are wonderful to cut and mix with other garden blooms. Add this Mediterranean herb to Italian dishes or sprinkle it onto pizza. An incredibly versatile member of the onion family, CHIVES bear pretty purple tufts on top of slender green stalks. Both flowers and stems are edible. The mild, oniony flavor adds kick to salads, soups, eggs, potato salad, or anything in need of a flavor punch. THYME grows easily in any well-drained sunny spot. While there are several varieties of this woody-stemmed perennial to choose from, English and lemon thyme are the yummiest for cooking. Thyme partners well with other herbs, and adds a recognizable flavor to soups and stews. Due to its vigorous growth, MINT is best confined to a container or a separate area of the garden so it won’t overtake surrounding plants. It tolerates some shade and prefers moist soil. Use mint in salads, cocktails, and Asian food, or make a tea from it. And don’t be afraid to experiment with different varieties like chocolate mint, apple mint, lime mint, and pineapple mint (all found at your local nursery). SAGE’s lovely pink flowers spire atop its fragrant, soft grey-green leaves. It’s pretty enough to use in flower bouquets, but it is also wonderful with roasted potatoes, squash, pork, chicken, and turkey. Annuals have a lifespan of one year, during which they grow quickly, produce seed, and then die. In our high-mountain climate, we treat rosemary (a perennial) as an annual, since it doesn’t overwinter at altitude. PARSLEY is one of the most versatile herbs you can grow. It’s relatively easy to grow from seed, yet purchasing a start saves time. Harvest the thick, flower-bearing stocks regularly to encourage leafy, green growth. 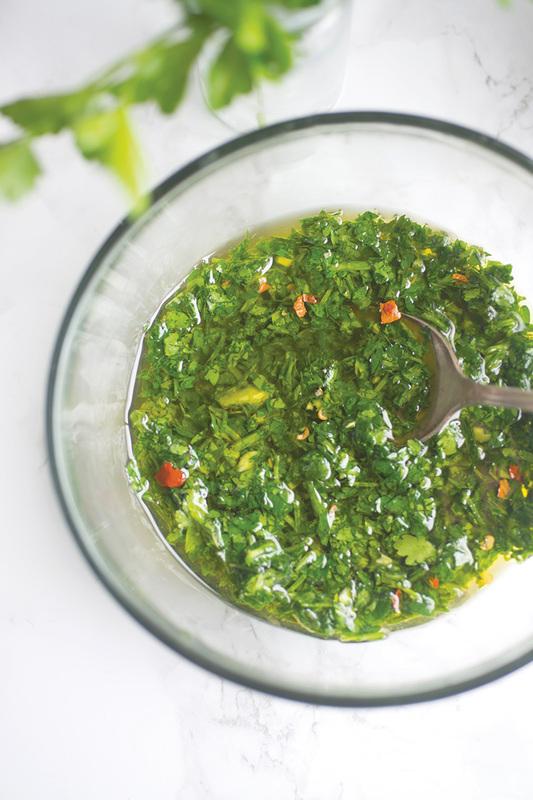 Use it for flavor and color in any savory dish, or make it the main attraction in a chimichurri sauce (see recipe on page 24) or tabbouleh salad. A quick growing plant, DILL is easily started from seed and yields a big, feathery bush (so give it some space). Harvest the tender tips throughout the growing season, and then allow flowers to form seed at the end of summer (for pickles!). Dill also loves potato salads, creamy dips, sauces, and seafood. ROSEMARY’s trailing varieties look beautiful grown in containers among other flowers or herbs. Pair its strong, resinous flavor with grilled meat (a must for the carnivore). Or stir rosemary into bread or pizza dough for a rustic Italian touch. What about BASIL? 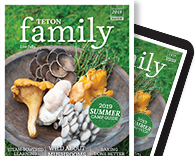 This much-loved herb is a tricky one for the Tetons—it will not tolerate cold. If you have a greenhouse, however, basil grows perfectly. For the greenhouse deprived, try growing basil in its own container. This allows you to shuttle it indoors at the first hint of cool temperatures. Place it in the sunniest, hottest spot you have, and snip off and use the flowering tips often to keep the plant leafy and productive. 1. DRYING is best for herbs like sage, oregano, thyme, and mint. Tie herbs into a bunch and hang them or lay them flat to dry in a cool, dark spot. When leaves are completely brittle, crumble them and store in glass jars or in Ziploc bags. Extras make great gifts. 2. Pack herbs into ice cube trays and FREEZE them after whizzing them with a splash of water in a food processor. Pop out the frozen herb cubes and store them in a Ziploc freezer bag for later use in recipes. 3. INFUSING herbs in vinegar or oil makes a beautiful gift! Place a handful of herbs into a glass jar, top it off with white wine, vinegar, or olive oil, and let it steep for two weeks. Strain the mixture into a bottle or jar. The name of this Argentinian sauce means “a mixture of several things in no particular order.” (You can’t really mess it up.) Use it as a marinade for, or a condiment on top of, your favorite grilled meat. 1.Pulse parsley, oregano, and garlic in a food processor until combined. 2. Transfer to a medium bowl and stir in the other ingredients.